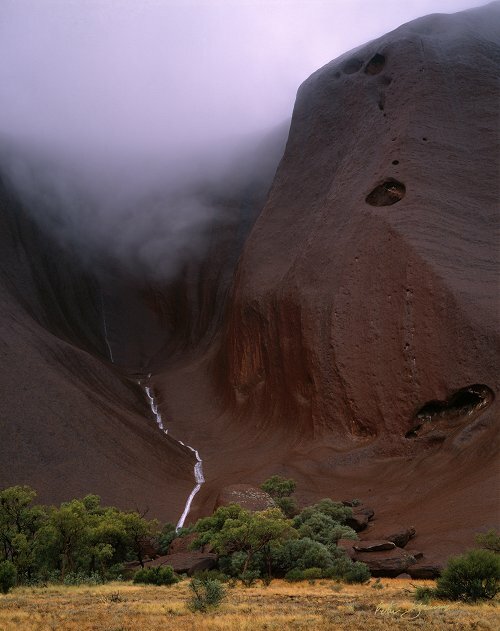 Swirling mist envelopes a rock valley from which a creek descends down a scalloped watercourse. Perhaps no other event better dramatizes the appearance or further transforms the mood of Uluru, than when one of the rare monsoonal downpours finds its way to the heart of Australia. With the light softened by overcast skies, and the low cloud case dancing and swirling around the lightning scarred ridges, new shapes and forms reveal themselves, and to see the colour of Uluru change to a sombre brown emphasises the dark brooding weather.